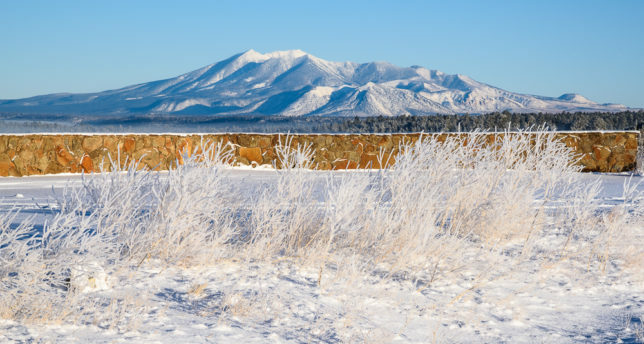 A winter storm in late February brought hope again of getting some photographs of the San Francisco Peaks covered in snow. So I departed before sunrise one morning to head out towards Mormon Lake. Because of the warm winter up through mid-February, most of Lower Lake Mary and Upper Lake Mary remained mostly ice free. With very cold early morning temperatures it was no surprise that there was fog over the relatively warm open waters of the lakes. When I left my house, the temperature was about +3°F. When I reached Lower Lake Mary, the temperature had fallen to -10°F—and there was considerable fog. A shallow layer of fog covers Mormon Lake. It was the same over Upper Lake Mary. I debated whether to change my plans and shoot photographs of the fog over this lake but after viewing the scene I chose to continue to the Mormon Lake Overlook. As I approached the overlook, I could see a layer of fog. Luckily, the overlook was just high enough to be above the fog. 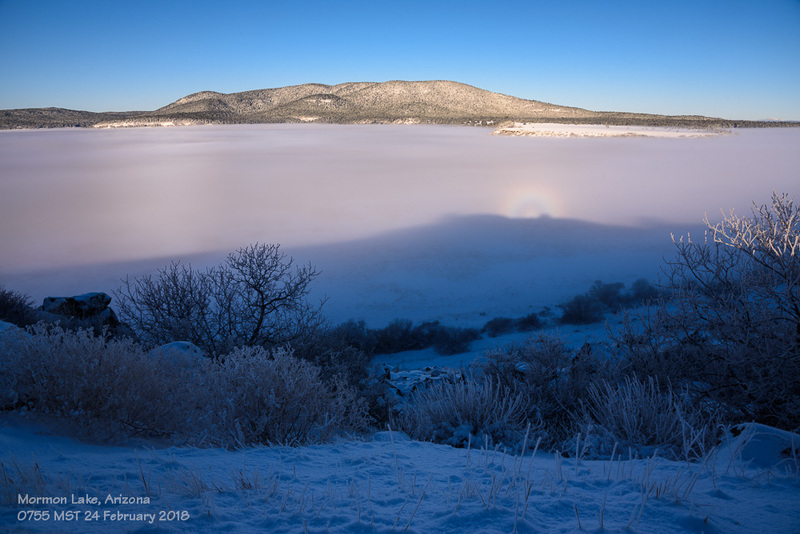 It was a beautiful scene with a shallow layer of fog covering the lake bed and snow on the distant San Francisco Peaks. San Francisco Peaks as seen from the Mormon Lake Overlook. After getting a few quick photos I set about to capture a panorama. I shot 12 images: 2 rows of 6 shots. The resulting image is huge and clocks in around 190 megapixels. I can make a print of this that’s 8 feet wide. But I probably won’t because I don’t have a wall large enough for something that big. It was obvious that sometime during the night the fog layer was much deeper as all the grasses, bushes, and trees were covered with rime ice. 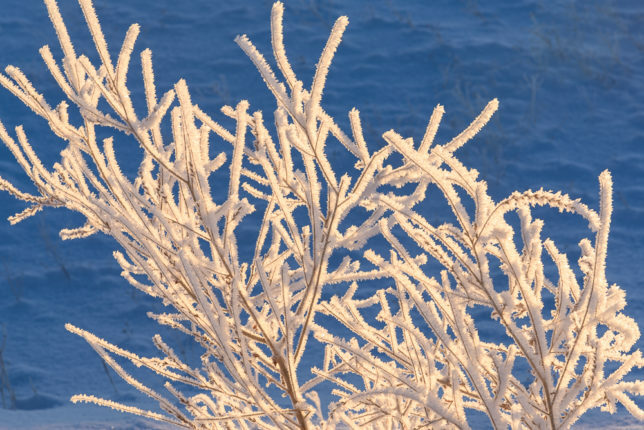 Rime ice coats the grasses and bushes. 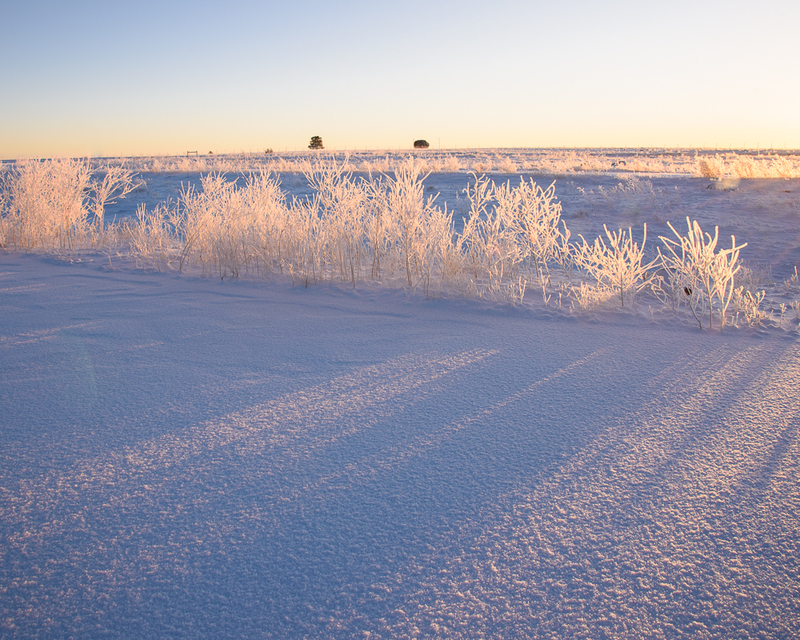 The rime created needles that pointed in the direction of the light wind that had been present during formation. As the sun rose above the horizon, the rime caught the light and sparkled brilliantly. A glory and a small segment of a fog bow are visible on the fog layer. So we had fog over the lake bed, snow on the mountain, and rime ice on the grasses. What else? Well, a glory became visible as the sun rose high enough to illuminate the fog layer below me. And a short segment of a fog bow was also visible in the fog layer. Not a bad day for photography.